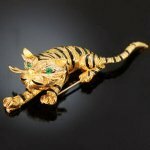 Antique and vintage jewellery, new or estate. Adin's exquisite jewelry collection houses some beautiful examples of engagement rings. To know something about vintage jewelry, one really has to dig into many (sometimes complex) factors. Some of these will be touched upon in the About Antique Jewelry section of the Adin website and in Adin's Vintage Jewelry Glossary. Although we do not intend here to delve into matters in depth, the following chapters give a good idea on vintage jewelry and what it's all about. Vintage jewelry (also called estate jewelry) is a term used for previously owned jewelry and for pieces of jewelry made in earlier (style-)periods and not necessarily pre-worn. It is not a dequalifying designation as many pieces of vintage jewelry typically feature fine workmanship and high quality stones, as well as one-of-a-kind pieces. To be called "antique", a piece must be more than 100 years old. Vintage jewelry includes many decades or eras. Each era has many different designs. These eras include Georgian, Early Victorian, Mid-Victorian, Late Victorian, Arts and Crafts era, Art Nouveau, Edwardian, Art Deco and Retro. Vintage is a term that varies even more than antique, mainly because collectors have different standards for what attains the vintage status in their particular area of speciality. The word vintage comes from wineries and includes quality in its definition "characterized by excellence, maturity, and enduring appeal" so while an antique can be anything that is particularly old (and assumably saleable) items that are vintage would be presumed to be of high quality. The stones used in vintage jewelry are usualy of a high standard as well. Most commonly used are diamond, sapphire, emerald, ruby and opal. Browse our catalogue to see what kind of vintage fine jewelry we have to offer for online sale. You can find gold, silver of platinum engagement rings, wedding bands or brooches. You can even find a nice necklace or bracelet. Here you will find an extensive list for the comparison of all ring sizes as used in all countries in their local units, both for new as for vintage rings.